Have you ever wondered how countries pick their national symbols? It is kind of like picking a mascot for a school or sports team. Most countries choose national animals, birds, fruits, etc. that fit their national character, are well represented in the history and culture of the country, have a large population in (or are exclusive to) the country, or just make the country look strong or majestic. Some countries go so far as to choose mythological creatures such as the unicorn (Scotland) or the phoenix (Greece). Australia is no different, but they've yet to make it official. While the kangaroo has never been adopted as the official faunal emblem of the country of Australia, it is featured on the Australian Coat of Arms (along with the emu) and it is unique to the isolated wilds of the Australian wilderness. 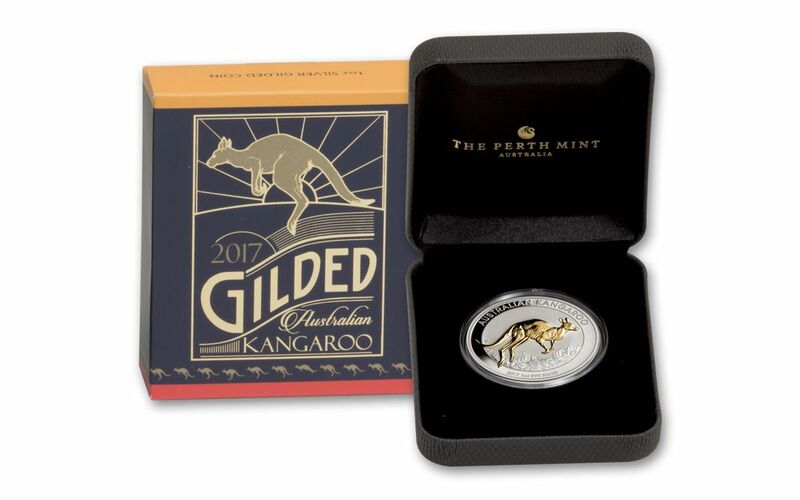 While this AUS 2017 1-oz Silver Kangaroo Gilded coin is not exclusively available through GovMint.com, you're already here, so why stray? 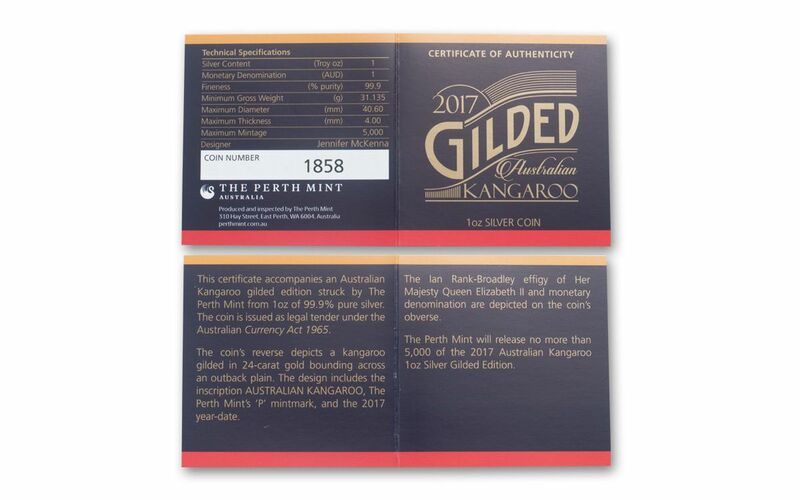 A LEAP FORWARD IN THE GOLD NUGGET SERIES-- This 2017 release is the latest in the now world-famous Perth Gold Nugget Series. The first coin in the series was minted in 1987. This Kangaroo theme was first introduced in 1990 to spur new interest in the Australian Nugget gold coin series and to ensure the rarity of proofs issued. ONE MARSUPIAL, TWO PRECIOUS METALS-- This stunning coin was struck from a full ounce of 99.9% pure silver. The Kangaroo featured on the reverse was gilded in 24-karat gold, making this classic natural symbol of Australian patriotism almost jump out from the background. 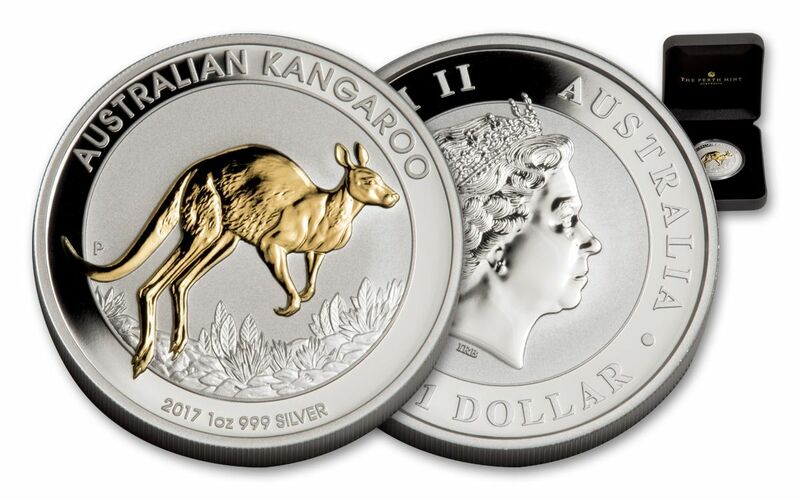 The reverse also features the inscriptions "AUSTRALIAN KANGAROO" and "2017 1oz 999 Silver," as well as the Perth Mint's "P" mintmark. 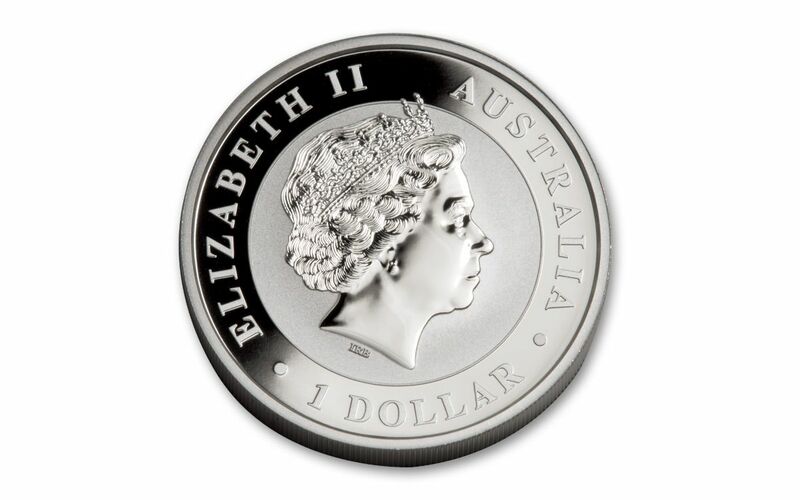 AUSTRALIA LEGAL TENDER-- Each AUS 2017 1-oz Silver Kangaroo Gilded coin is $1 AUD, legal tender in Australia, a fact reflected on the obverse by the inscriptions "ELIZABETH II," "AUSTRALIA," and "1 DOLLAR" along the border, surrounding Ian Rank-Broadley's effigy of Her Majesty Queen Elizabeth II. TOO PRETTY TO PUT IN YOUR POCKET-- Each coin will arrive at your door in a sleek Perth Mint display case, coupled with the coin’s numbered certificate of authenticity. SECOND RELEASE, LIMITED MINTAGE -- This is the second release of the Gilded Kangaroo in the Gold Nugget Series. With a limited mintage, you'll need to jump on this offer to ensure it a spot in your collection. Some animals are predators. Some animals are scavengers. But you? You're an opportunistic creature that knows when the getting is good. 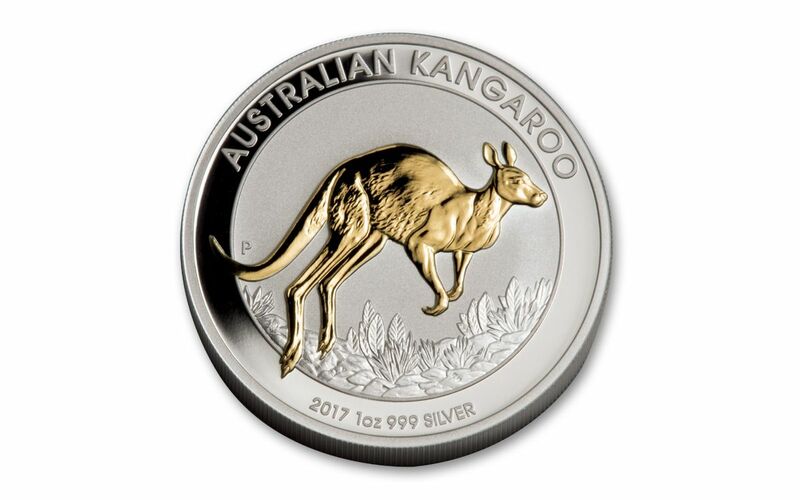 Put this AUS 2017 1-oz Silver Kangaroo Gilded coin in your shopping pouch (cart) now!